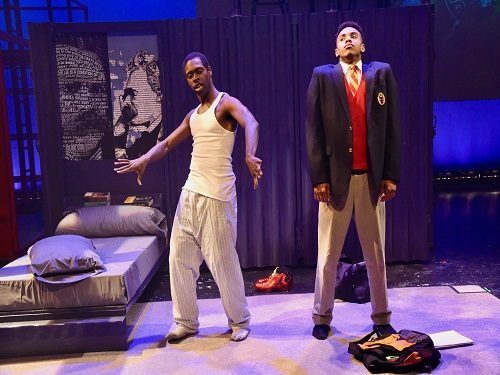 (L to R) Jeremy Keith Hunter as Tru and Keith L. Royal Smith as Marquis in “Hooded, Or Being Black for Dummies” at Mosaic Theater Company of DC, January 25—February 19, 2017. Photo by Stan Barouh. Audiences are used to being told to silence or turn off their devices prior to a show. But what happens when they’re encouraged to turn the volume up high, scroll through Facebook and respond to texts for the next 100 minutes? How do they react when they’re told the story about to be explored is not worth paying attention to or capturing for social media? Last night, Officer Borzoi (Frederick Strother) quickly grabbed the sold-out audience’s attention with this opening scene during the world premiere of “Hooded, Or Being Black for Dummies.” Written by local playwright Tearrance Arvelle Chisholm and directed by Serge Seiden with associate director Vaughn Ryan Midder, “Hooded” closes out Mosaic Theater Company of DC’s “Clamorous Encounters” series. “Hooded” unravels layers upon layers of intersectionality between race, age and identity, bouncing from comedy to tragedy. …Chisholm’s play is undeniably compelling. “Hooded, Or Being Black for Dummies” follows the story of Marquis (Keith L. Royal Smith), a poised prep school student from Achievement Heights, who meets street-savvy Baltimorean Tru (Jeremy Keith Hunter) in the local holding cell. Both are detained unlawfully and released when Marquis’ adopted mom Debra (Jennifer Mendenhall) arrives. From that moment forward, each scene creatively makes accurate jabs and jokes about the difference in their upbringings, outlooks on life, relationships, confidence and self-understanding. The comedic tone takes a turn towards the end, bringing the audience back to the harsh reality of ever-present, stereotypes and the life-altering effects quick judgment has on young African-American men, no matter the time, place or circumstance. The play showcases incredible talent from its eight-person cast. Hunter was remarkable in his articulation of dialogue and characterization of Tru. Royal Smith did an impressive job convincing the audience of Marquis’ confused, then curious state of mind about his identity. Together, their acting really drove home Chisholm’s layering of feelings, thoughts and questions about whether there is a right way to identify oneself and why. Dylan Morrison Myers’ gradual transformation as Hunter, one of Marquis’ best (white) friends, is comedic, while his portrayal of Headmaster Burns turned last night’s audience silent. Similarly, Mendenhall’s successful portrayal of Debra, Marquis’ mom, had the audience shaking their heads and voicing their disapproval of her crass dialogue and rescuer attitude towards Tru. In a play that highlights resurgent events around race relations, Strother does a superb job as Officer Borzoi, portraying varying treatment, dialogue and actions police take depending on who’s in the same room. Throughout the show, the scene shifted from holding cell to bedroom, schoolyard to neighborhood. Sound Designer David Lamont Wilson and Lighting Designer Brittany Shemuga worked well together to signal the changes with appropriately timed background music clips and video projections. One notable addition to the Sprenger Theatre was the laugh light, which Officer Borzoi points out in the beginning scene. I found it quite interesting how the audience’s laughter coincided less and less with the light as the play went on. Set designer Ethan Sinnott also does an excellent job by keeping the set simple, with two main boxcar-looking pieces that get turned or moved across the stage depending on the location. The show is accessible to all who come to see it, including deaf and hard-of-hearing audience members, thanks to projected surtitles. Mosaic Theater Company’s world premiere of Chisholm’s play is undeniably compelling. I left questioning my feelings, pondering my own opinions and wondering what will happen next to the men Marquis and Tru represent. Advisory: There is intermittent profanity, so this show is recommended for audiences 16 and over. “Hooded, or Being Black for Dummies” plays through February 19, 2017, at Mosaic Theater Company of DC in Washington, DC. For more information or to purchase tickets, call the box office at (202) 399-7993 ext. 2 or click here.